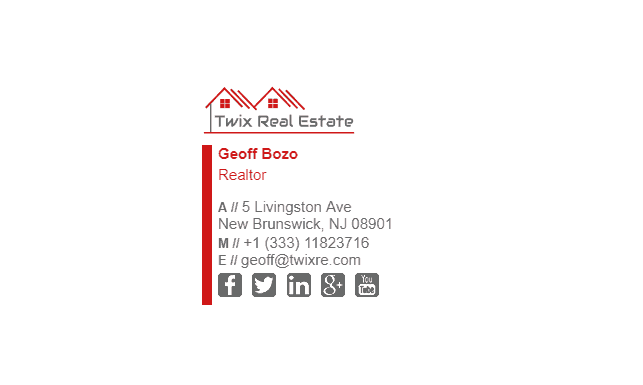 Are you looking to transform your realtor email signature into a lead generation machine? Of course you are. That’s why you’re here! There’s a reason a lot of realtors use a professionally made email signature – because they generate leads. 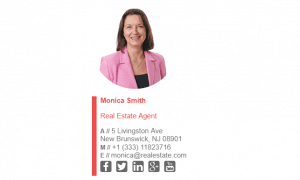 In this article, we will show you everything that’s needed to create a successful email signature for your realty business. 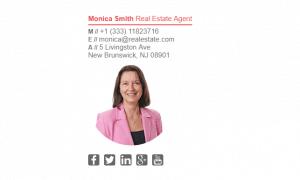 Although you’re free to use any fields you want, most of the real estate email signature’s we’ve seen have the above fields in them. The template you choose to create your realtor email signature can either make this journey a breeze or extremely difficult. With that in mind, ensure you choose a template that is very flexible and will provide you with all the options you require. When we talk about options, we mean the positioning of the text/images, styling, fonts etc. 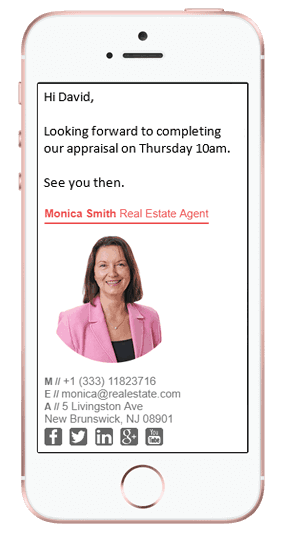 Knowing that 68% of emails are opened on a mobile device, it’s important to make sure that your real estate email signature template is mobile friendly. Important: Don’t choose a template that has 90% of the features you need, and think that you can easily add the other 10% on. It doesn’t work like that. It takes many years of coding knowledge to modify an email signature. So, unless you’re confident with coding HTML and CSS, I would just choose a template that is 100% suitable from the start. 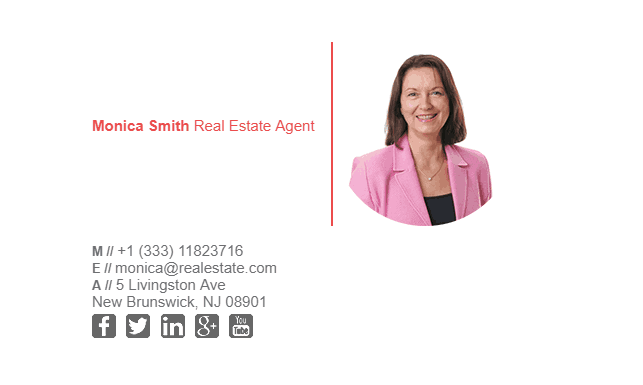 Bonus: Check out our FREE email signature templates for realtors. 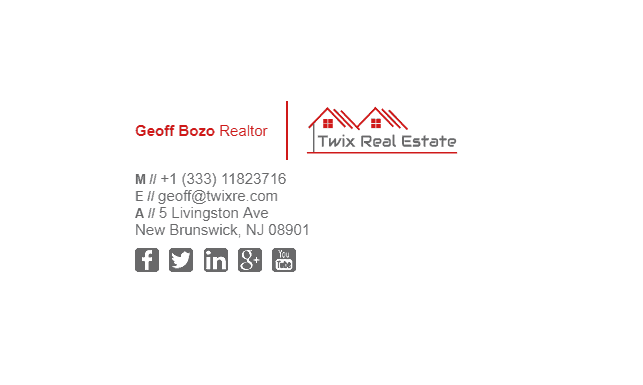 One of the greatest barriers that real estate agents face when dealing with clients is the trust factor. 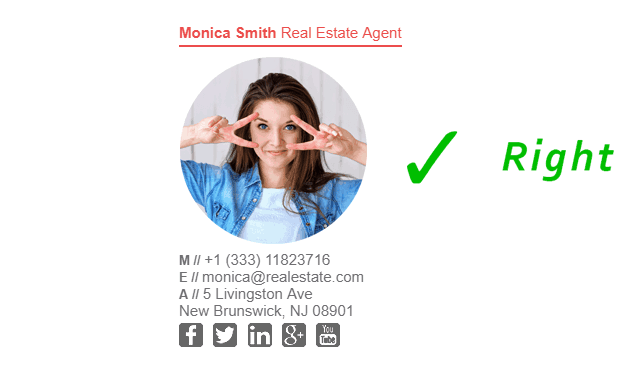 It’s difficult to establish trust with a person when emailing them, but evidence shows that having a picture of yourself in your email signature does increase conversions. Think about this, would you ever go see a client if you’re wearing a balaclava? Well, that’s what email is – a faceless communication channel. The quickest and easiest way to increase trust when emailing someone is to have a picture of yourself along with your real estate license number(s). Don’t choose a bad quality or outdated photo. Instead, spend a bit of money for a professional photo shoot. 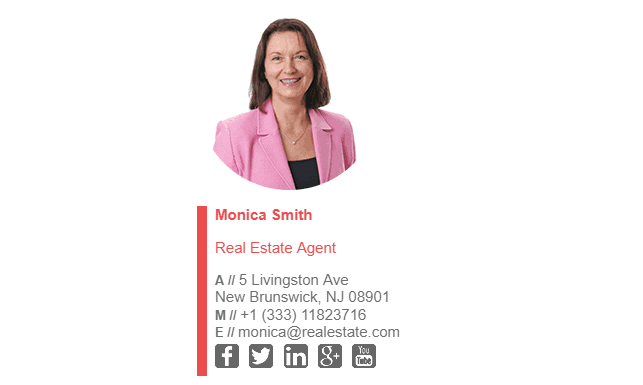 Also, try not to use the typical real estate photo with you facing the camera sideways and posing a fake smile. It’s been done to death and your customers can see right past that. Instead, have a photo of you laughing while giving the thumbs up. In fact, any photo that will get your customers talking is a good photo. It’s a great conversation starter which makes it easy to break the ice. 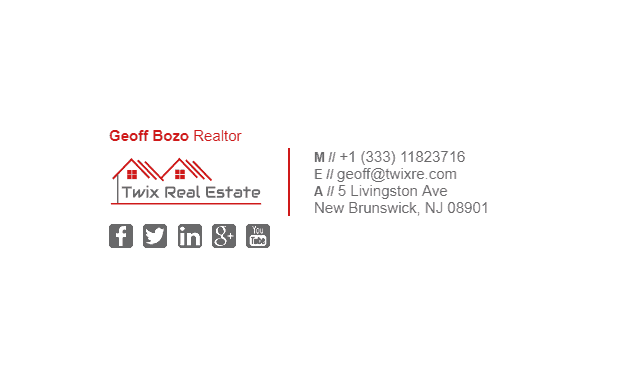 Remember, when using images in your email signature, always compress the images so they are smaller in size. Provide at least 3 methods for your prospective clients to contact you – but no more. 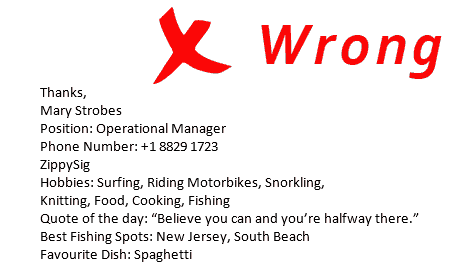 Having too many contact fields can be overwhelming and cause confusion. 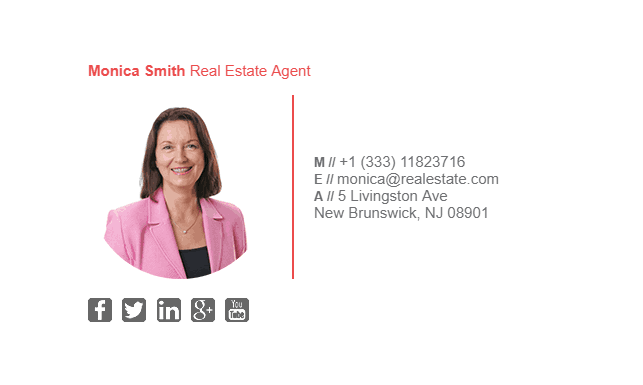 The best contact methods for real estate agents to use are Mobile Phone, Office Phone, and Email Address. Using click-to-call on your phone numbers is essential. 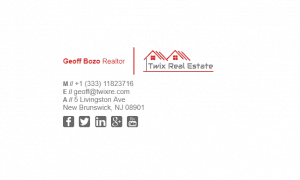 It allows your clients to simply tap the phone number in your email signature to make the call directly from their phone. It would be silly not to have it when we know that most emails are opened on a mobile device. Contacting you should be as easy as possible! As Neil Patel says “Nothing beats social proof”. Winning your clients’ trust will be easier if you show them your social media pages and allow them to see that people love your work. If you can, get your past clients to leave reviews on your Facebook or LinkedIn pages, as your future clients will likely be checking them out. This is where all the marketing magic actually happens. 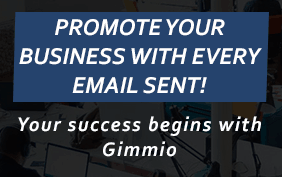 Your email signature banner is the place where you can mention any discounts, hot offers, awards, recently sold properties or any news you wish your customers to see. Having a banner that has a link to your website can be a great way to create engagement with your customers. Make sure you link to a well-made landing page that is optimized for conversions. If you use Gimmio to create your email signature, you can easily insert a banner. Have you recently landed a top figure sale that your prospective clients should see? Mention it in your email signature. 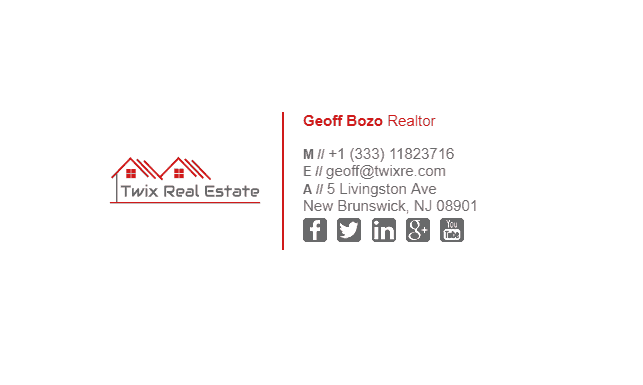 We always like to use the 50/50 rule for email signatures. 50% of it should be used to identify you and show your contact information. The other 50% should be used for marketing and promoting yourself / your company. 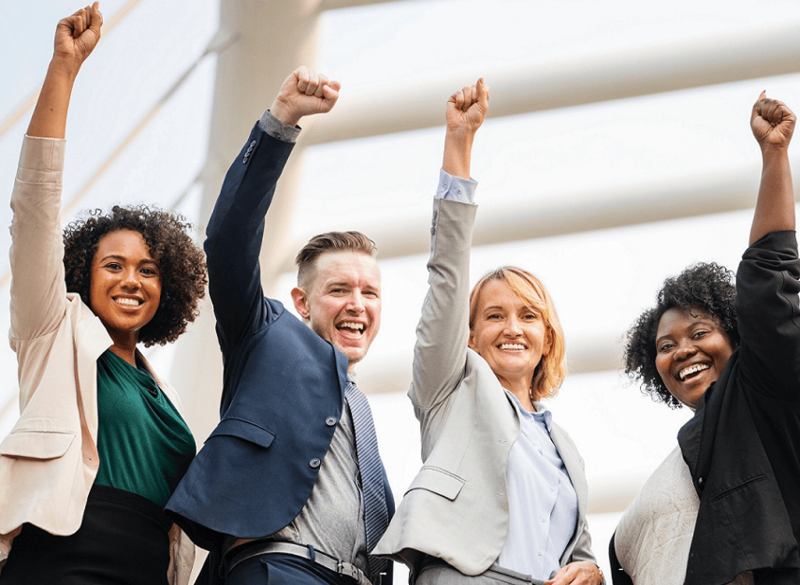 With this in mind, now is the time to think about your latest achievements and how they can inspire your potential clients to sign up with you to sell their house. These days, reviews are everything. You want to buy a toaster, you read the reviews. You want to buy a TV, you read the reviews. I’m sure you get the idea. 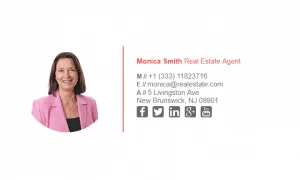 It’s no different with realtors. Selling a residential house or commercial property is a big deal, and in most cases involves hundreds of thousands of dollars worth of transactions. We don’t recommend you have reviews directly in your email signature but instead, have a link to the reviews on your website or another website. Whilst inspirational quotes can be a good addition to informal emails, they don’t have a place in a professional work environment. They usually clutter email signatures and make them bigger than needed. There is nothing worse than seeing 10 social icons in an email signature, as it makes the whole signature look too cluttered. Sometimes, too much choice is a bad thing. It’s best practice to display no more than 3 social media channels for your business. Any more than 3 and you will struggle to keep them all up to date. 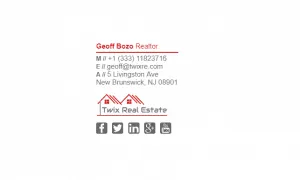 Sometimes we see email signatures that contain nicknames. 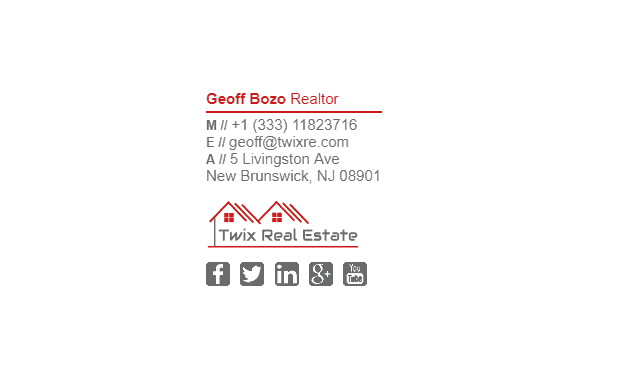 Its ok in some circumstances, but not when you need to portray a professional image to your real estate clients. Once you’ve created your email signature, get 5 people to take a look at it. If even one of them says “Yes”, shorten it. Long email signatures not only take up valuable space but can become an eyesore and annoying to your clients. An email signature should only be about 25-30KB in size. 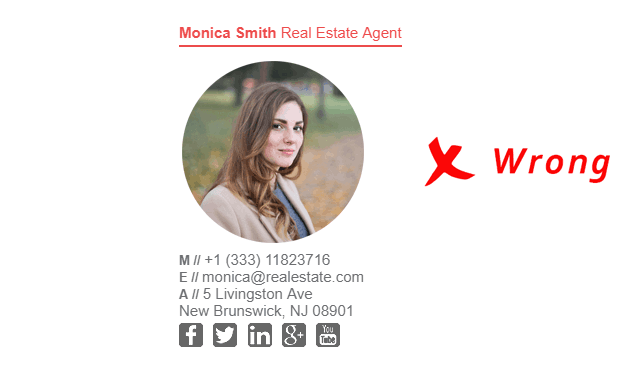 Embedding a video in your realtor email signature is a very bad idea as it will cause all sorts of problems not only for you but also your recipients. If you really must have a video, you could always provide a link to it in your email signature – that’s a much better way to do it. The same goes for GIF’s. They really don’t have a place in email signatures. Don’t send your full HTML email signature on replies. 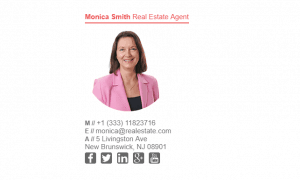 Set up a reply/forward email signature. Most of the time a simple text-based signature is fine since they will already have your full email signature from your first email. Your email signature is a marketing opportunity. If you’re like most real estate agents, you likely send out hundreds of emails per week. All these emails can turn into marketing opportunities if done right! 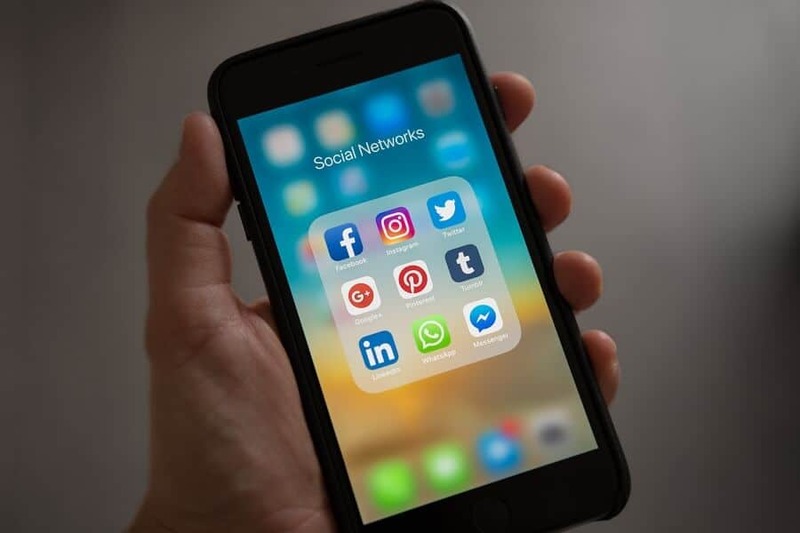 Encourage your recipients to connect with you on social media. This will help you build a bigger following, which in turn will get your more good reviews. If you enjoyed this article, make sure you share it with your real estate buddies! 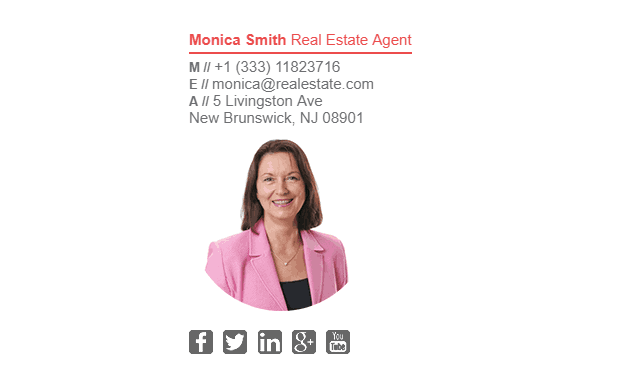 And remember, Gimmio can help you create the best realtor email signature in just a few minutes.